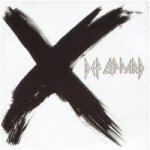 Def Leppard played a show on the X/Ten tour in Sioux City, IA on 19th July 2003 and a fan review was sent in by Stephanie. The show took place at the River Cade Festival in Chautauqua Park - with a rowdy crowd. "Soon after that Joe got of the stage and walked all the way down the center isle they had fenced off that went through the crowd. I thought that took a lot of balls after what had just happened. There was also an idiot that threw his empty stack of beer glasses on stage and hit Phil in the leg. Phil got this very startled look on his face."